The United States Women’s National Team (USWNT) filed a lawsuit on March 8 against the United States Soccer Federation (USSF) on claims of gender discrimination and violations of equal pay. The USWNT alleged that the USSF has failed to provide adequate pay for its accomplishments and has neglected the women’s team in favor of the men's. The question of adequate pay has been a recurring issue in women’s sports, especially for the USWNT, who has arguably been better than its male counterpart in recent years. The New York Times reported that USWNT players make about $3,600 a game, with a $1,350 bonus if they win the game. The men’s team makes $5,000 a game and over $8,000 in winning bonuses. Despite claims that the men’s team is more popular, the stark difference in pay-per-game raises questions, especially if the USWNT is more successful on the pitch. With three Women’s World Cup titles and four Olympic gold medals to its name, it is beyond time the USWNT players receive the financial compensation they deserve. The women’s team has built a name for itself and with its dominance at the No. 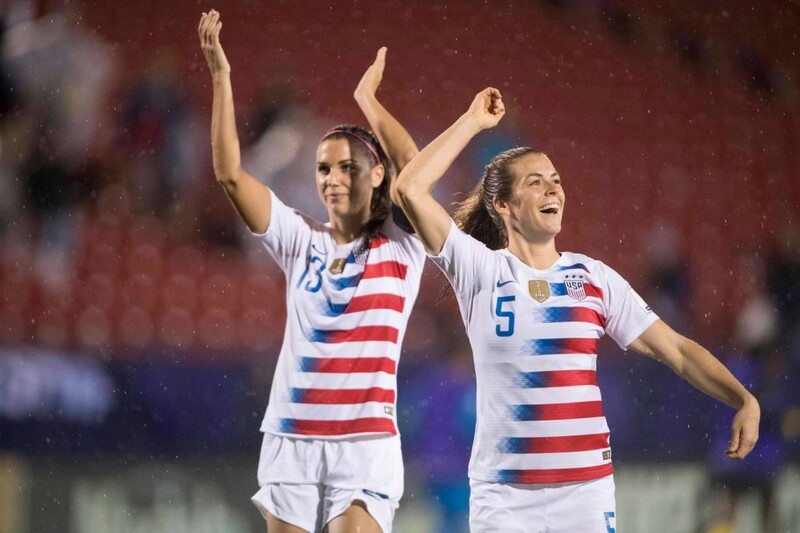 1 spot on the FIFA Women’s World Rankings, household names like Alex Morgan and Tobin Heath have been elevated to legendary status. Still, there are those that still discredit women’s soccer, which hurts the pay of USWNT players. “I just think that there’s room in our world for both men and women to play professional sports and to make a living off of it,” said USF women’s soccer coach Denise Schilte-Brown. Other sports, such as softball compare to women’s soccer in their search for adequate wages. While it isn’t a direct counterpart to baseball, softball is often compared to America’s Pastime. Earlier this month, MLB right fielder Bryce Harper signed a 13-year contract with the Philadelphia Phillies worth $330 million. On Tuesday, center fielder for the Los Angeles Angels, Mike Trout, signed a 12-year deal worth $430 million, the largest contract in professional sports history. The highest paid player in National Pro Fastpitch (NPF) is arguably the best pitcher in the league, Monica Abbott, who signed a six-year, $1 million contract in 2016, according to ESPN. Abbott’s deal was the first million-dollar contract in league history. Due to the NPF’s salary cap restrictions, her base salary is $20,000 each season and the rest of her pay comes from attendance bonuses — she still gets paid the amount on her contract, but that amount is not entirely from her base salary. Now, comparing Harper, Trout and Abbott’s wages is like comparing apples to oranges. It seems ridiculous to compare them, considering the revenue brought in by MLB clubs compared to NPF’s Scrap Yard Dawgs. But $20,000 a year is not enough to live on, which discourages college athletes from going pro. The level of skill of pro softball athletes may even match the biggest names in MLB, according to Corrick. Corrick thinks events such as the Olympics will showcase the individual talent of players and then, hopefully, attention will be drawn fast-pitch softball. Like the USWNT did with the USSF, it remains to be seen if softball players would ever take a similar approach to ensure they’re paid adequately for the work they put in. “It’s the balance of how hard can I shake the cage before it breaks and what are my repercussions if I do so,” said Corrick. “Obviously, if they did [take legal action] and they won, it would change the entire sport for everyone. If they didn’t it would almost push us back … it is a little bit of a gamble. At the end of the day, that gamble shouldn’t be a threat to men’s sports. The goal is coexistence. The USWNT’s latest lawsuit against the USSF has done more than put women’s soccer in the spotlight. It’s opened the door for all women’s sports to push for something that’s been past due.